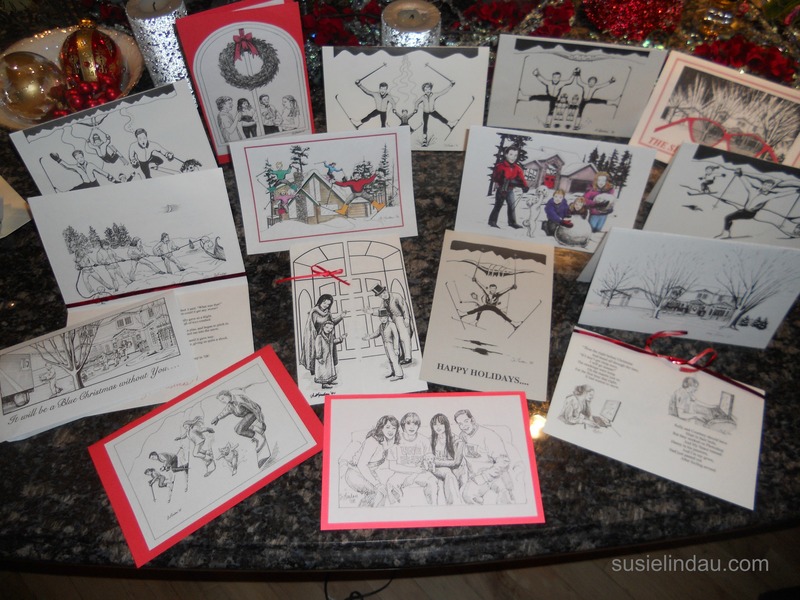 I’ve been busy drawing, cutting, pasting and folding this year’s Christmas card. I think I’ve listened to almost every corny holiday movie between the Lifetime and Hallmark channel. Every year has its challenges. In the past, I sent out my cards after more than sixty hours of work and they boomeranged back for more postage! Last year I had to add extra postage for weight. This year I thought I had it handled, but the post office was closed, so I couldn’t check the weight. I was about to throw them in the mailbox, then I decided to take them home just in case. Some of my older cards. The newer ones are popups. Good thing! I found a major quality control problem. This Santa’s elf has been overworked and hasn’t ever made a cent. There are four illustrations in this card and after I stuffed all the envelopes and glued them shut, I noticed one of the extra cards had duplicated illustrations. Danny and I were on the left and the right. What was I thinking? Another had Kelly and Courtney on both sides. GAH!!!! I had to open every card and check each one. Six cards were screwed up! Thank God I caught the error. They would have been super weird. I’m blaming all of it on the Lifetime and Hallmark channels. I would love to send you one of my homemade cards. Want to win one? Leave a comment and my husband, Danny, will pick names from a hat. On Friday, I’ll announce the winners and will link up their blogs. Tweet this out and I’ll ask my 9,000 followers to follow you! My Christmas Cards unveiled HERE! I was thinking about your homemade cards the other day! You are a better woman than I am, haha. So that’s why my ears were ringing! Wow! Thank you so much. I am just more insane, that’s all. I always used to send out Christmas cards, but I’d hardly get any in return, so that discouraged me. So this year, I decided to not send out any cards. Not sure if that was the right move, but it did save me some work. Oh no! Don’t give into the Grinch! I’ve cut back on the cards to my friends because of that, but I made 80 to send. Happy Holidays to you! 🙂 Thanks for the tweet! That’s some holiday dedication ! Nice work ! Thank you! It all started when I was first married 26 years ago. It has evolved from a simple illustration to a pop up card! I … just… can’t…. stop… myself!!!! I’m so glad you entered! Glad you caught it. I don’t send cards out. I’m terrible at doing that type of thing. The thought occurred to me that I had pasted the innard skinnards upside down. I didn’t find any like that, but having duplicated drawings would have been awful! For some reason, this tradition has really stuck. Thanks for entering! Ha! No spiked eggnog for me. I think I needed a day off to recharge. Maybe tomorrow! You always make the cutest cards… I send some out but nothing like what you make! Looks like the aftermath of my granddaughter’s sleep-over !!! I bet it’s a lot more fun!!!! They were a riot !!!!!!! First time in years I’ve made or sent cards….this year….YES! I think you’ve inspired me…no…you have inspired me. Happy Holiday wishes to you and yours, Susie…and the rest of your Lindau crew. I’m so glad! It’s a simple feel good time of year and cards are part of the reaching out to others. It’s like a little hug. Happy Holidays to you too! Thank you! WOW! we made all our christmas gifts this year and Im so pleased with them! All of your Christmas gifts??? What did you make? Did you change your blog? It’s not showing up in my reader! I’ll be honest- I haven’t done Christmas cards in years (honestly, can’t remember the last time we sent them out) but I have respect for the folks who still send them. And even more mad props for the folks who make their own cards, rather than just purchase a box or two. You’re cool. I’d love to be on your Christmas card list. Maybe you will be! Danny will draw names tomorrow! It is a tremendous amount of work. I gave up my annual Christmas party, but the card tradition is alive and well! I haven’t sent cards out in so long, I don’t even know where people live anymore. Perhaps I should just send them to strangers. You should!!! That would be hilarious. Send them to random people and don’t forget your brag letter. My Christmas cards have become New Year’s cards! I did my best, but they were too time-consuming. The year they bounced back, I know some didn’t get them until after. Tis the season! 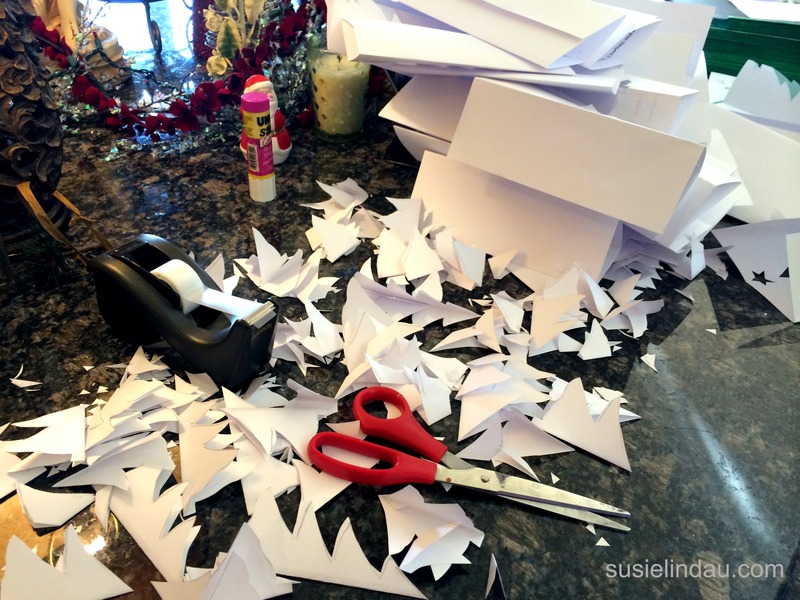 Even your mess looks like a beautiful project!~ Please put me in your hat, Susie, and happy holidays to everyone at your house too. Happy holidays to you Abby!